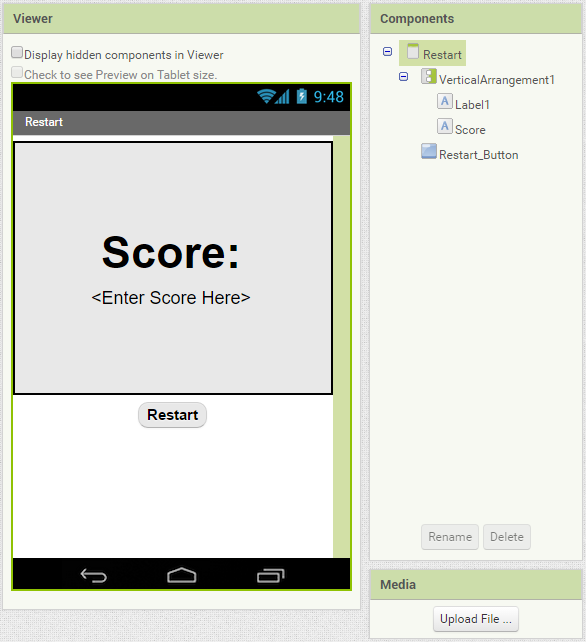 This updated tutorial uses the template used for designing traditional app inventor tutorials. The old tutorial has been replaced as this new one is much more informative and understandable. This game has been won the app of the month[youth] August 2015. This tutorial assumes you are familiar with the basics of App Inventor– using the Component Designer to build a user interface, and using the Blocks Editor to specify the app’s behavior. If you are not familiar with the basics, try stepping through some of the basic tutorials before continuing. Connect to the App Inventor web site and start a new project. Name the new project “Catch!” (without the double quotes) and set the screen’s Orientation to Sensor. The finished Catch app will display a screen with a ball and a Begin Game button. 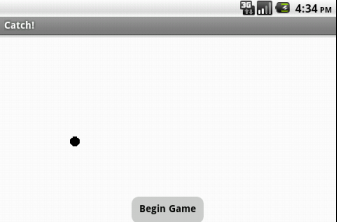 On clicking the button, the ball starts moving and a timer appears. To win the game you will have to catch the ball within the given time. 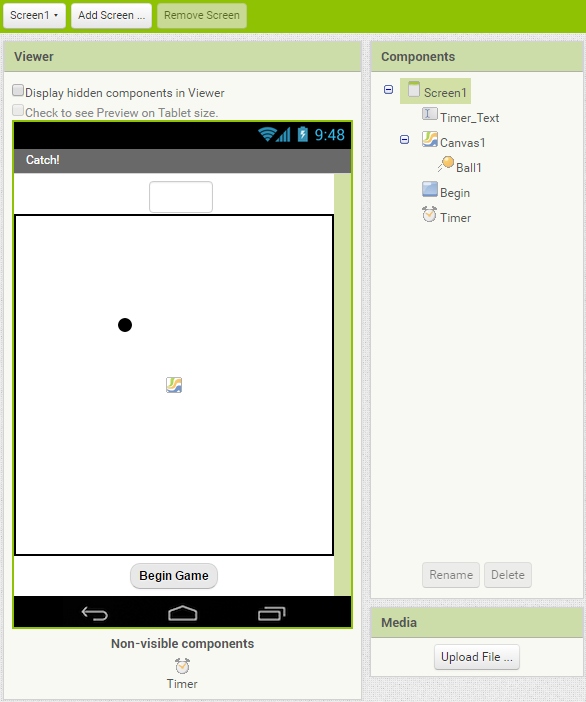 Use the component designer to create the interface for Catch!. 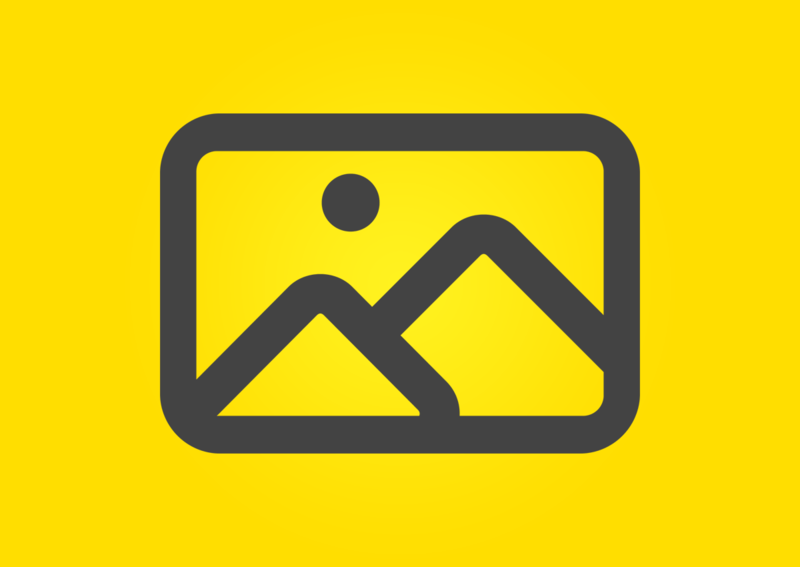 When completed, the designer should look similar to the snapshot below. Timer_Text Set Width to 50px, TextColor to Orange, FontSize to 20px, and FontBold to True. also Set Hint to [blank]. Canvas1 Set Width to Fill parent… and Height to Fill parent. Timer Set TimerEnabled to False,TimerInterval to 1000, an TimerAlwaysFires to true. Most blocks in App Inventor require you to know exactly what component your app will manipulate when you design the app. For some apps, you will have several of the same type of component and you want to program the same behavior for all of the similar components. The blocks in the Advanced section allow you to build some general manipulation on some type of component. Setting the Width and Height property for a Canvas works exactly the same way as setting the Width and Height of a Button. For whatever positive number is set, the Canvas will resize its appearance to fit that value. There are two values that are exceptions to the using positive values rule: -1 and -2. Setting Canvas.Width or Canvas.Height to -1 is like setting the Width or Height to Fill parent in the designer. Setting Canvas.Width or Canvas.Height to -2 is like setting the Width or Height to Automatic in the designer. Warning: You can set the Canvas Width and Height to any positive number you want. The Canvas will change its size to match the values you set; but on some devices, the Canvas does not change its size correctly. The behavior on such devices is usually unpredictable. The Begin.Visible block takes a true/false value (also called a boolean) to tell it whether to show the button or not. 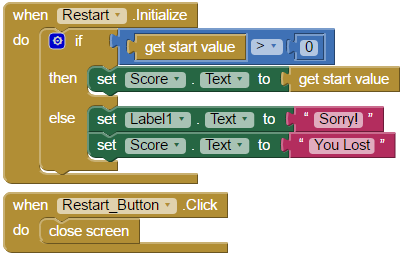 Setting a Begin.Visible block to true causes the button to be visible.The open another screen with start value block open another screen whose name is given as screenName. It also passes information through a startValue which can be used in the other screen. set/get [global score](x3) Variables Sets the value of the global score variable. The Timer.Timer block executes commands after every interval. The interval in our case is set to 1000(ms). Changing the Timer_Text.Text block’s value changes the text shown in the textbox.The if block makes a decision depending on whether the attached block is true or false. open another screen with start value has been discussed about earlier. 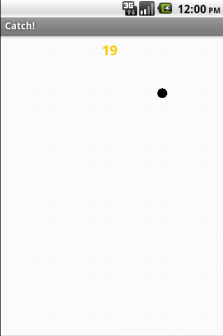 Ball1.EdgeReached Ball1 Executes commands when ball touches the edge of its canvas. The Ball.EdgeReached block executes commands when the ball reaches an edge of the canvas.TheBall1.Bounce block makes the ball bounce off a given edge. Use the component designer to create the interface for the Restart Screen. When completed, the designer should look similar to the snapshot below. VerticalArrangement1 Set Height to 250 px… Width to Fill parent… Align Horizontal/Vertical to Center. Label1 Set Text to Score: … FontSize to 50… and FontBold to True. If…Else Control Executes a set of commands if condition is true and another set if it is not. Congratulations! You have successfully completed this app. You have made a neat little game using timers, conditionals, logic statements and much more. Package the final version of the app by Build save .apk to computer / get Barcode When the barcode appears, use the barcode scanner on your phone to download and install the app. Add sound effects and backgrounds.